Freeze drying technology is used in particular for removal of moisture from the products usually of biological origin without causing any noticeable change in the original characteristics. Besides this, the driers are also used for various applications involving micro-organisms, plants, tissues etc. Heat-sensitive biological materials may be freeze-dried without affecting their potency. 1. 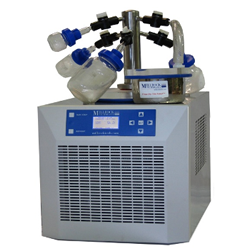 Pressure control or automatic control of vacuum for faster drying & reproducible results. 2. Extremely compact while incorporating technical features & outstanding control performance. 3. Vacuum integrity tested with vacuum preseal. 4. Data logging & display of temp & vacuum in mbars. 1. 50 x 50 cm [dia x length] Standard Chamber with adjustable heated shelves for accelerating drying process. 2. Optional Multiple port flask manifold with valves. Hot gas for defrosting. 3. Overall light weight, energy efficient, low maintenance and sturdy construction. 4. Corrosion free exterior and interior, designed for continuous production of ice throughout the day. 5. Micro processor based temperature control.